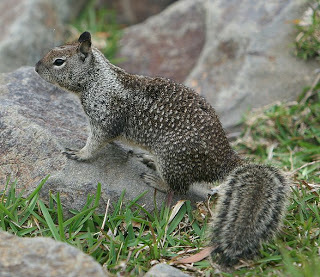 The common California Ground Squirrel is found in the northern part of Baja California, throughout California, western Oregon, and central Washington. The squirrel measures between 16”-18” in length, including its bushy tail that is about 5”-7” long. A larger ground squirrel, the Rock Squirrel, is found in southern Nevada, Utah, Colorado, Arizona, New Mexico, western Texas, and the panhandle of Oklahoma. Ground squirrels den underground. They can climb, too. These fascinating and adept small mammals are found in agricultural and rural areas as well as in vacant lots and gardens in populated areas. They tend to avoid areas that are very moist. It helps to approach ground squirrel problems by realizing that ground squirrels were here before us and that they intend no harm to humans. They are simply going about their lives with the same basic needs as we have: searching for shelter and safety, finding food, establishing families, and raising their young. Many people enjoy watching ground squirrels and give them safe harbor on their property. Killing ground squirrels is cruel and pointless because they can soon repopulate a vacated area. If you have ground squirrels on your property, develop a tolerance for having some around while making an effort to keep them away from the areas where they bother you most. Do not take measures to exclude them or make their habitat unwelcoming when they are raising babies (March through summer). Don’t feed them. Don’t feed ground squirrels or any wild animal. They have evolved to find their own food. If wild animals are fed by humans they will stay around and their population will likely increase. Remove attractants; modify their habitat to encourage them to move elsewhere. Remove old pipes, rock piles, brush piles, and debris among which they like to scamper. Let weeds, grasses, and other vegetation grow high. They don’t like tall vegetation because it prevents them from seeing approaching predators. Wrap sheet metal cylinders around fruit and nut trees to prevent easy climbing. A shade cloth visual barrier deters ground squirrels. Install solid fences to limit ground squirrels’ ability to see their predators. They will feel less safe and more inclined to move. A 12-foot wide piece of shade cloth was folded in half (for extra strength and opacity) to make a long strip of cloth 6-feet wide. The strip was suspended along a fence that extended for 400 feet. Fasteners were placed every 2-3 feet at the top and at each pole. 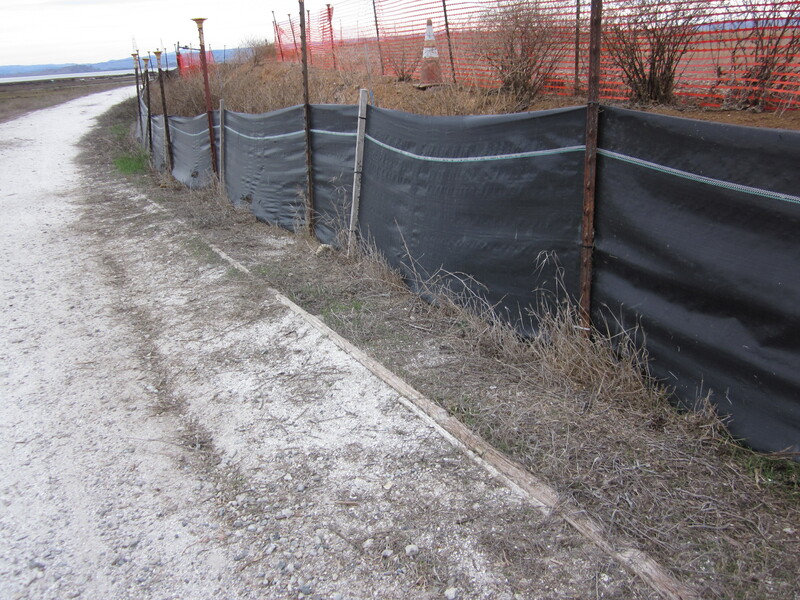 Three feet of the 6-foot wide strip was flattened on the ground, extending out from the fence for the 3 feet. The cloth on the ground was covered with 1.5” drainage rock 2- inches deep. Vegetation was allowed to grow 2-3 feet high and wide in front of the shade cloth. At first assessment, ground squirrel activity was reduced 30%, and no new burrow holes were found. Provide mounds for them. Give them a place to go. Ground squirrels are attracted to gently raised mounds of earth and rocks. If you have enough space on your property, consider attracting them to elevated mounds in a specific area. Then erect a solid fence of wood or shade cloth with tall vegetation next to it to make a visual barrier between the area with the mounds and the rest of your property. Give the squirrels enough space near the mounds in which to forage. The squirrels may hesitate to venture beyond the visual barriers and stay close to their burrows in the mounds. That’s the goal. Devices such as the ScareCrow or Spray Away attach to a hose and squirt bursts of water when activated by movement. If the height of the nozzle can be lowered to ground squirrel level these devices may have a deterring effect at a particular entrance to a burrow. Activate the devices only during the day when the squirrels are out and about. Try some of these deterrents suggested for gophers. Don’t provide them with food, water, or shelter. Band and trim trees so they can’t climb up them. Don’t leave water out. Make the ground where they live unattractive. They prefer soft dry soil to make their burrows. Poke a piece of dog or cat poop in their hole. Till the ground around their holes. They don’t like the taste of spicy hot sauce and a product called bitter apple. Spray these liquids on things you don’t want them to chew. It washes off. Ground squirrels can climb over or dig under almost any fence. A loud radio or strobe light put down their hole might get them to close that part off and move elsewhere. Hawks, bobcats, coyotes generally eat squirrels. Dogs like Jack Russells will scare them away. Ground squirrels eat lawn grass, leaves, seeds, and insects so it’s tough to get rid of all their food. If you can at least keep food they like to a minimum, the population should stay steady. There is a birth control chemical, but it’s not legal for use by the general public. In 95% of a park it stopped births. It reduced the squirrel population in one area only by 30% because people kept feeding the squirrels. Expect that it will take time for these methods to produce results. Eventually you’ll achieve a level of harmonious co-existence.